GREENE concept is pleased to announce the Emphasis range of chairs. 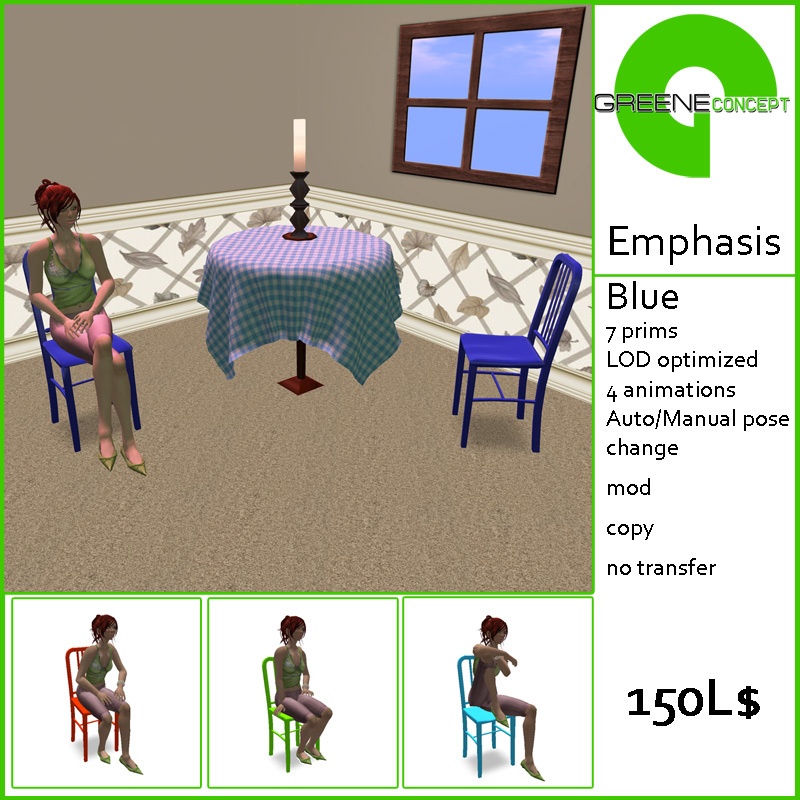 Inspired by the modern classic “Emeco 1006 Navy chair”, a back-pleasing aluminium chair fabricated in a 77 step process, the Emphasis range offers a LOD (level of depth) optimized modern sculpted look with only 7 prims (including shadowprim). Each Emphasis chair contains 4 poses that can be manually changed or automatically cycled. Emphasis is availbale in 9 colors: Blue, Gold Metallic, Green, Orange, Purple, Red, Silver Metallic, Sky and Yellow. The menu-driven “Any Color” pack allows seamless tinting plus adding shine and glow. 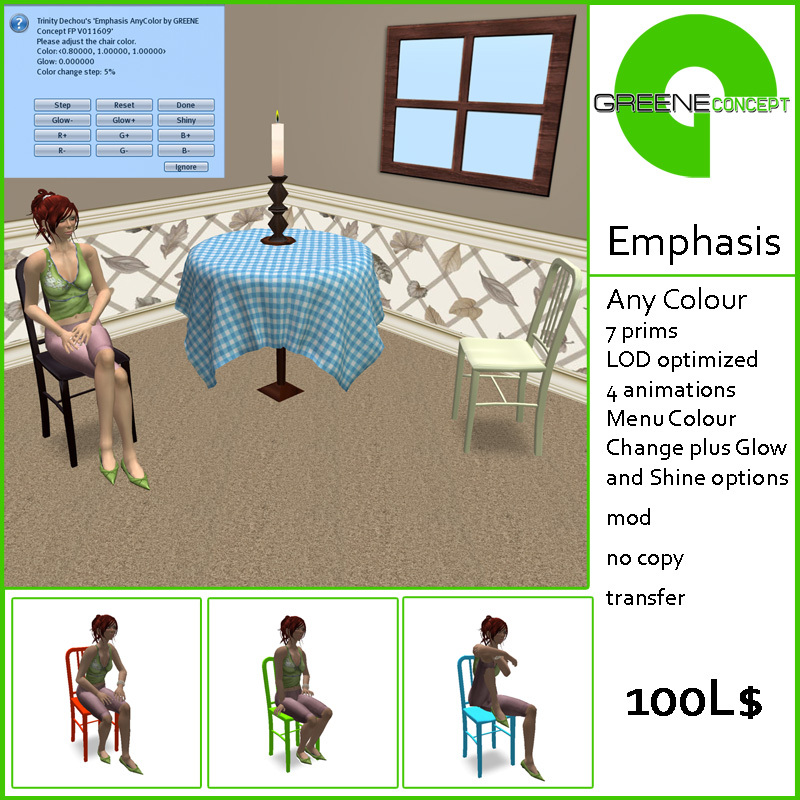 The chairs are available in our shop at Beachwood and will be on OnRez and Xstreet SL soon. [13:57] Ivanova Shostakovich: What’s whisper range? Ooookay, This is a chair I just finished sculpting. I uses six sculpted prims and it is modeled after an aluminum chair by Emeco. I actually have a red one here in my ‘office’ that I got at Full Upright Position in Portland a few years ago. The sculpts are not quite finished yet as there are still some lines I need to make more organic and flowing. For instance, the sculpt which makes the seat needs to be a bit tapered in width from the front to the back. And the legs could use some tapering and a bit of rounding. I am trying to make it as LOD friendly as possible. I have been wondering why the default RenderVolumeLOD setting in the viewer is set at 1.25 (or something like that). A setting of 2 to 2.5 makes sculpts work with distance a bit better. Probably it’s to let the viewer be speedy as possible on as wide a variety of machines as possible.